On December 26, 1948, an F-47N military aircraft, (Ser. No. 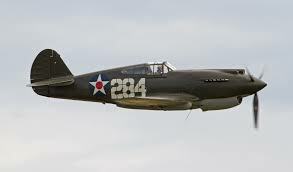 44-89370N), piloted by Captain James E. Elsner, 29, took off from Bradley Field in Windsor Locks for a training flight. After a flight of about 50 minutes, the captain was returning to Bradley when he noticed the aircraft loosing power, and then the engine stopped completely. Knowing he couldn’t make the runway, the pilot retracted the landing gear and made a crash landing through some trees and power lines before skidding to a stop about 500 feet short of the runway. The plane didn’t catch fire, and the pilot escaped without injury. 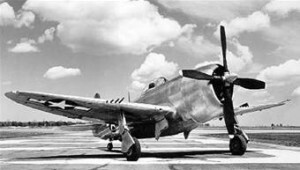 On April 4, 1942, 2nd Lt. Robert E. Gibson was landing at Bradley Field in a P-40E (Ser. No. 40-425) when a strong crosswind suddenly pushed the aircraft off the runway and into an obstruction wrecking the plane. Fortunately Lt. Gibson only received minor injuries. Lt. Gibson received his pilot’s rating March 9, 1942. He was assigned to the 66th Pursuit Squadron.